Atlus has released this year’s online consumer survey to know more about what their customers want. The previous surveys had much more participation than they expected, and they helped Atlus make use of them in a meaningful way, so they would be thankful if this survey does the same. 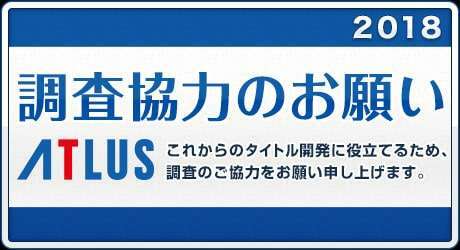 Different from the previous times, Atlus states that, to meet requests from customers who participated last year, part of the data from this questionnaire will be released at a later date. The Japanese questionnaire is set to last from January 26 to January 30 at 11:59 PM JST. The list of questions from the survey is below. For questions that I feel are especially interesting and should be highlighted, see Questions 55 to Questions 66. Q1: Please tell us about your profession. Q2: Who are you currently living with? Q3: Among the following platforms, which do you own? Q4: Among the platforms you own, how often do you play them? 11 different options per platforum, ranging from things such as Netflix, watching DVDs, and reading e-books. Q5: If you are playing the following devices, when was the last time you played them? 7 different options per platform ranging from every day, to played within the last six months. I am going to buy this device. I know about this device, but I’m not sure if I’m going to buy it. I know about this device, but I’m not going to buy it. I don’t know about this device. Q7: Please select among the options that apply regarding your display situation when playing on a stationary, home console (connected to a TV). 8 possible answers concerning the quality of the screen the person plays on, including a 4K TV, a 4K monitor, a less than HD monitor or a projector. Q8: Among the dedicated home consoles you play the most (for TV screens, non-handhelds), why do you play on them? Q9: Among the portable devices you play the most (devices played without the need of a TV screen), why do you play on them? Same 23 possible answers as the above. Q13: What are your favorite game genres? Q14: Among the following games, which ones do you know of? Q15: Among the following games, which have you purchased? I bought this (regardless of new or used). I have no plan to purchase this in the future, and I am not considering to. Q16: For the games that have not been released yet, are you planning to purchase them? I’m going to purchase it. I do not want to purchase it. For the following questions, media for 9 games will be shown, each with the following questions about what the user thinks of them. It seems it can be played for a long time. The visual design is cool. It seems like an interesting game. I would like to play this with friends. I would like to play this if I have free time. I would like to play this on a big screen TV with a console. I would like to play this on a handheld game machine. I would like to play this for free. I would like to play this as a smartphone game. Q17: Please take a look at the game visuals and select what you feel. Q18: Please take a look at the game visuals and select what you feel. Q19: Please take a look at the game visuals and select what you feel. Q20: Please take a look at the game visuals and select what you feel. Q21: Please take a look at the game visuals and select what you feel. Q22: Please take a look at the game visuals and select what you feel. Q23: Please take a look at the game visuals and select what you feel. Q24: Please take a look at the game visuals and select what you feel. Q25: Please take a look at the game visuals and select what you feel. A world/setting with the feeling of an underground subculture. The BGM is worth listening to. A world/setting with an occult feeling. A fictional world setting that is easy to empathize with. A world/setting in contemporary Japan. Good design of non-human characters such as Atlus’ own demons. A fun and deep story. Good design of things other than characters, such as user interface. User interface that emphasizes comfort and tempo. A world/setting around anarchy or opposing authority. The feel of the difficulty level and game balance. A play experience and themes that are thought-provoking. There is no particular application. I do not know Atlus (very well). Q27: Please select the applicable choice for each music event of the following game titles. I have not been, but I’d love to go. I have not been and I’m not going to go. Q28: How much free time do you usually have per day? 2 answers, with 10 options ranging from 1 hour to 18 hours or more. Q29: What do you spend your free time with on weekdays, weekends and holidays? Please choose all that apply. Q30: Have you ever seen an anime of the “Persona” series before among the below? If you have seen it, please indicate where. I watched it on a TV broadcast. I recorded it and watched it. I watched it with a video distribution service. I watched it on a DVD / Blu-ray disc. Q31: Have you ever seen the theatrical version of “Persona 3”? If you have seen it, please indicate where. I saw it at the theater. Q32: Among the devices that were selected as “I own this” in a previous question, on average, how much time do you spend with them during weekdays? Q33: Among the devices that were selected as “I own this” in a previous question, on average, how much time do you spend with them during weekends or holidays? Q34: Which media do you usually obtain game information from? Please choose all that apply. Q35: How much do you use a PC or a smartphone when gathering game information on the internet? Q36: For those who obtain game information on Twitter, how do you do so? Looking at a friend’s post. Look at posts from people who often send out game information. Look at posts of talents and voice actors. Look at the official accounts for each game title. Q37: For those who obtain game information on LINE, how do you do so? Look at official game media account LINE posts. Look at the official game account posts on LINE. Look at posts on my LINE timeline. Q38: Please select all the social services you use to write and post. Q39: Do you recommend games to friends on social media? Please choose all that apply. Q40: What kind of content do you post on social media? Q41: When do you usually use social media on weekdays? 13 options per social media, with a variety of time intervals. Q42: When do you usually use social media during weekends and holidays? Q43: How frequently do you watch live game broadcasts on the following media? Q44: Please select all the reasons that apply from the following to watch live broadcasts of a game. Q45: How much money on average are you free to use per month? 7 answers, ranging from less than 5,000 yen to 100,000 yen or more. Q47: Where do you learn about new games to buy on dedicated home consoles and handhelds? Q48: Where do you buy games on dedicated home consoles and handhelds? Q49: How much do you use a PC or smartphone when purchasing from a mail order website. Q50: What influences your decision to buy games on dedicated home consoles and handhelds? 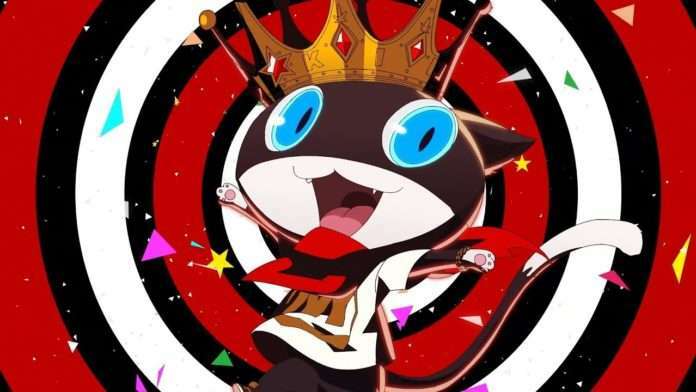 Q54: To those who purchased “Persona 5,” to what extent did you play the game? Q55: If the following “Persona” series title as follows was released, would you think “I want to play this”? If that’s what you would think, please answer for which devices. I want to play this on PS4. I want to play this on PS VR. I want to play this on PS Vita. I want to play this on Nintendo 3DS. I want to play this on Nintendo Switch. I want to play this on smartphones. I want to play this on PC. I do not want to play this / I’m not interested. Opening of collaboration shops, etc. There’s nothing that particularly makes me feel like purchasing it. Q59: How do you usually listen to character voices in-game? Always listen to the voices fully. In an environment where I can listen to it, I listen to it as fully as possible. Only listen to character voices in important scenes. I only fully listen to the voices of my favorite characters. Because I mostly skip, I only hear it occasionally. I do not listen to character voices at all. I don’t need it. Q60: If a full remake of past Atlus titles was made (adding additional elements to the existing title and brushing it up), would you think “I want to play this?” If that’s what you would think, please answer for which devices. 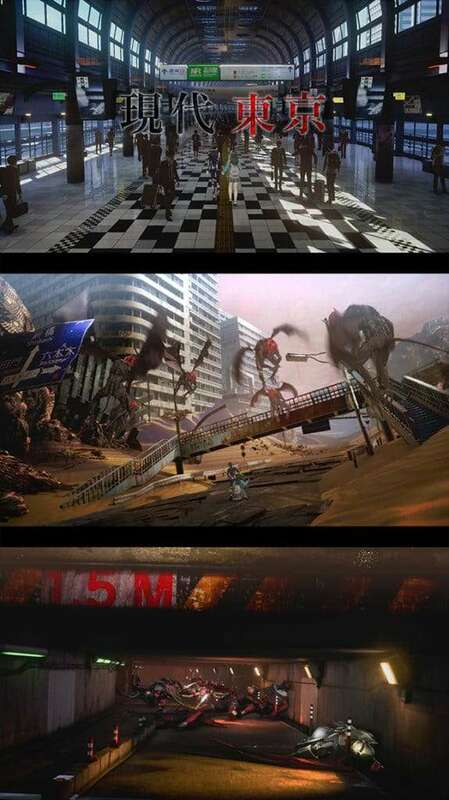 “Shin Megami Tensei” series title produced by another company. “Persona” series title produced by another company. 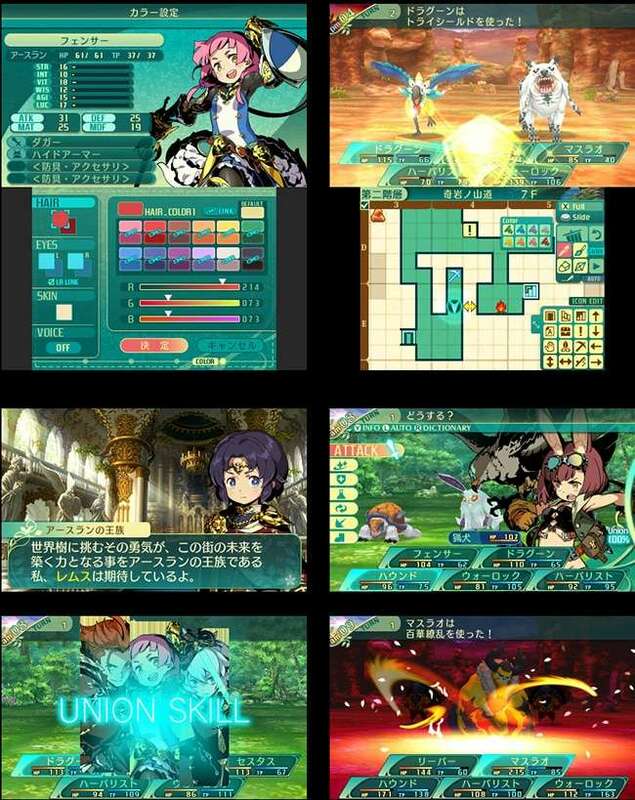 “Etrian Odyssey” series title produced by another company. “Persona Q” series title produced by another company. “Persona” dance series titles such as “Persona 4: Dancing All Night” produced by another company. “Persona” fighting series title produced by another company. 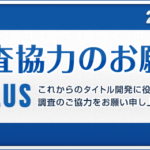 “Devil Survivor” series title produced by another company. 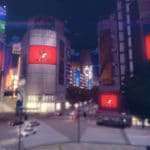 “Devil Summoner” series title produced by another company. “Soul Hackers” series title produced by another company. Q62: What are your impressions on the possible following initiatives Atlus would take in its future? 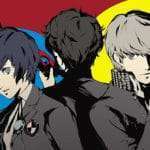 Q63: To those who answered supporting Atlus to develop a completely new title, in the future, when a completely new game among the following is released, how much do you want to play it? Q64: When the following game sequel (numbered title) is released, which would you want to play for which devices? Q65: If you have a request for Atlus, please write it down. Q66: This is the last question. Do you believe in the existence of the “Phantom Thieves”? Phantom Thieves? What is that? I do not believe in something meant for elementary school students. I think their existence is a good thing. I believe in the Phantom Thieves!